Electricians are specialized craftsman who install, replace, and maintain electrical equipment. Every type of licensed electrician requires training to take on various electrical jobs. 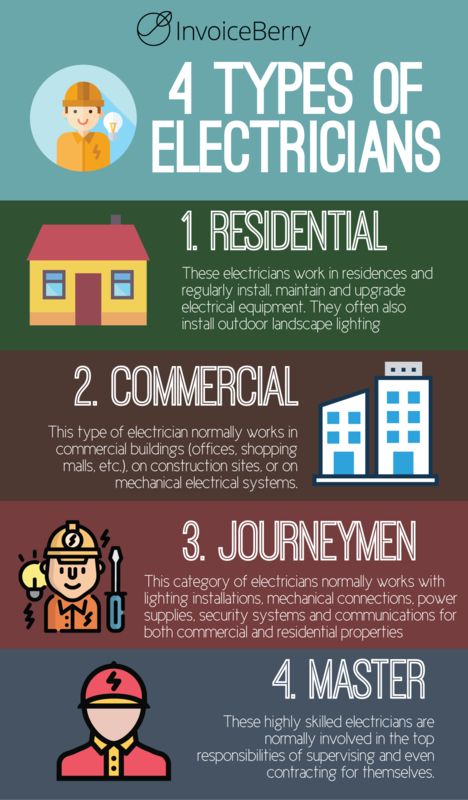 Below you will find the four most common types of electricians. Residential electricians can install, replace, and repair electric systems in homes and apartment buildings (with single-phase electrical service). They also do electrical work outside of the surrounding areas. Their range of work can be a simple fix of an outlet or replacing lighting fixtures to rewiring a home or apartment building. Their expertise lies in these jobs, both large and small. Training combines classes, an apprenticeship which is usually four years under the supervision of extremely experienced electricians. Commercial electricians work on large commercial jobs and projects (with three-phase electrical service). They work in larger buildings with more complex and complicated projects. Not only do they install and maintain lighting and electrical services, they will also install workplace water heaters, commercial security systems, key entry facilities, fire alarms, and can even involve fixing heavy machinery. Before a commercial electrician is licensed, they must work under a master electrician for several years. The majority of journeyman electricians work in construction, but they also work in other areas, such as large utility companies and manufacturing plants. They do not require as much supervision as residential and commercial electricians. They complete additional training courses and an exam. Once they have passed the exam, they don’t require extensive supervision. Journeyman electricians can work on both residential and commercial jobs. Typical work includes lighting system installation/repairs, security systems, and power supplies. Master electricians are highly skilled craftsman who have 7+ years of experience as an electrician. They generally work in a management or supervisory positions or own their own company. They also require additional ccourseworkand a master electrician exam. They are involved in overseeing their employees and projects to ensure they are done correctly. This could be the installation, repair, or maintenance portion of projects. All electricians can do residential projects, but not commercial. Electricians typically start as residential electricians, then move into commercial because it’s more complicated. They may or may not become journeyman electricians and master electricians because this requires additional coursework, training and examinations. Major benefits of moving up the electrician rank is higher pay and responsibility. Electric Supply Center has all the materials every electrician needs for their jobs. With five locations across Massachusetts, feel free to stop by our counters or call today! If you have questions about which products each location carries, contact us. To learn more about ESC or contact us, go to www.escctr.net or click here to send an email.